Florida's Department of Transportation is switching from its "color coded" U.S. highway signs to the standard black-and-white signs, under pressure from the Federal Highway Administration (FHWA). The Florida DOT argued that drivers could simply follow the color of the sign to their destination, but the FHWA said it would be forced to "withhold certain monetary funding if the state of Florida continued to use their color coded markers." Here is the traditional color-coded scheme. Select a sign to see a larger version of the sign. The Alt U.S. 27 sign has green numerals on a white background. 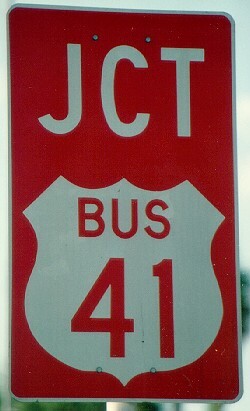 The Business U.S. 41 sign has orange numerals on a white background.